The Fourth of July: The day when We The People fire up the grill, pop fireworks, and gather together with our friends and family to celebrate our Independence. With most of us planning a get together or BBQ of some sort, we figured Basket would help out with the most expensive aspect: the food. Luckily, Basket Budget menus bear in mind that just because America is celebrating her independence, doesn’t mean we have excess cash to spend on the meal. 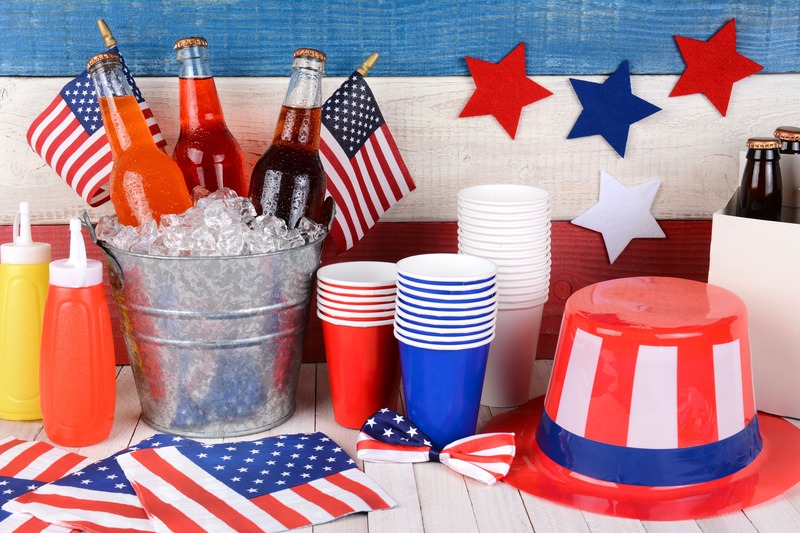 So, we’ve whipped together a few budget friendly recipes to put the party in patriotic. If you couldn’t tell by our Memorial Day Basket Budget Menu, we always kick start the celebration with an adult beverage. 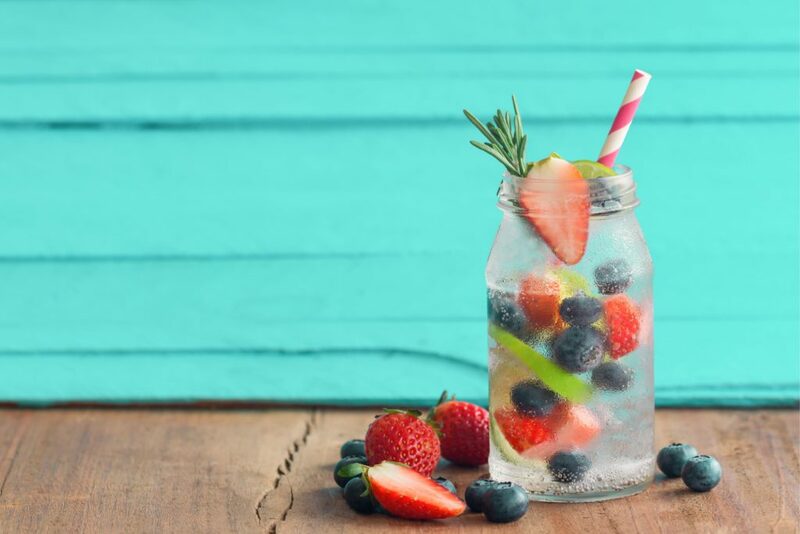 To keep cool on the Fourth, try your hand at making this patriotic blueberry and strawberry mojito. Muddle the blueberries, strawberries, mint, lime juice, and sugar in the bottom of a tall glass until the sugar is dissolved and the berries break down. Add the rum and stir to combine. Next, fill the glass with ice and top with club soda. Stir to combine, and add additional berries for garnish. Of course, these beverages could be created sans-alcohol for any Designated Drivers or underage guests. Replace the club soda with 7-Up, Sprite, or any other lemon-lime soda that may be on sale for a sparkling flavor that still reps patriotic colors. When your guests walk in, you want to make a statement. 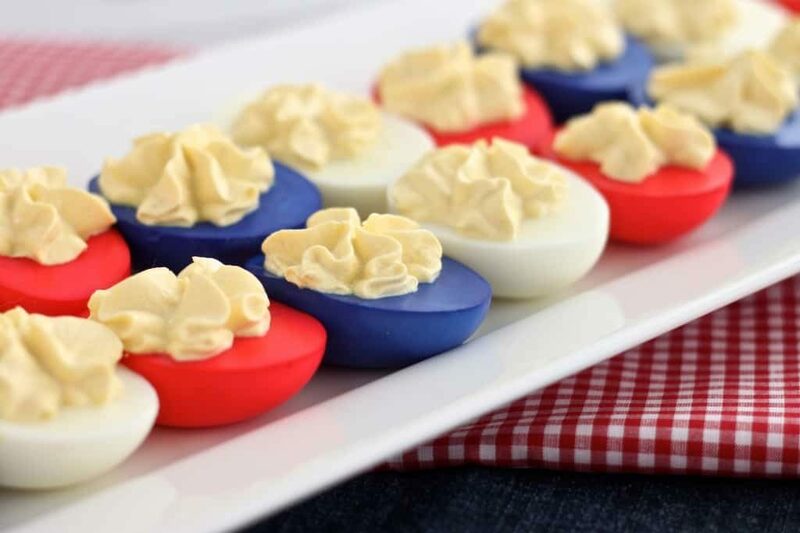 What better way to declare your patriotic pride on Independence Day than with red, white, and blue deviled eggs? Already a BBQ classic, these fan-favorites get a makeover with some simple food dye. Check out the example below from kitchen wizard Created by Diane. Peel the eggs and cut in half. Take out the yolks and place them in a medium bowl. Combine one cup of hot water with one teaspoon of your red food coloring and a tablespoon of white distilled vinegar, and mix well. Place six of the egg white halves in the coloring and let them sit for 1-2 minutes or until the desired color is reached. Repeat this process with the blue coloring and another six egg white halves. Once removed from the mixture, let the egg whites sit on a paper towel for a few minutes to allow excess color to drip off. For the filling, use a fork to mash the yolk until it is super fine. Add the yogurt, mayonnaise, mustard and a dash of salt and pepper. Whip until creamy. Arrange the eggs in a red, white, and blue pattern onto a serving tray and spoon your filling into the center. If you’d prefer to pipe the filling into the eggs, simply place your yolk mixture into a Ziploc bag and cut a triangle off the corner of the bag – behold, your very own DIY piping bag! Easy to make and light on the budget, these are a win-win dish. At Basket, we’re big fans of grilling. Looking to grill up something that just screams, “America”? 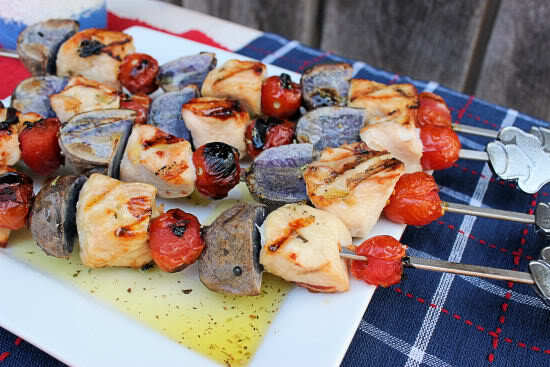 Try out these chicken kabobs with blue potatoes and cherry tomatoes first seen on Big Bear’s Wife‘s blog! Begin by cubing both the chicken and the potatoes. On a wooden or metal skewer, slide a tomato, a cube of chicken, and a potato cube onto the skewer until it is full. Repeat in the pattern of red, white, and blue. Heat grill racks to 375 F and place the skewers to cook for six minutes on each side, or until chicken is done. In a small bowl, combine olive oil, thyme, basil, oregano, and salt and pepper and mix well. Once the kabobs are off the grill, drizzle with the olive oil mixture and serve. End the night right with a festive cake that we guarantee will make an appearance (or two) on Instagram. 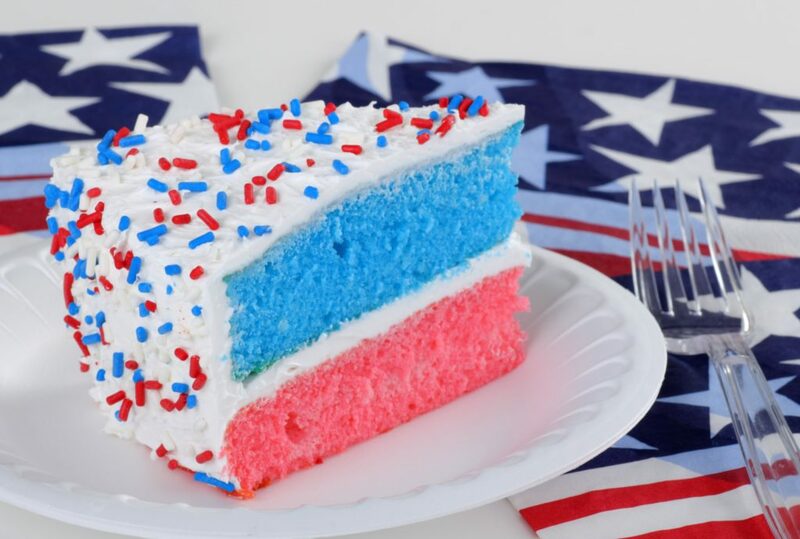 We’re talking about this patriotic cake that you can whip up in a snap, and without breaking the bank! Follow the instructions on the cake mix box by combining the oil, water, egg whites, and cake mix in a large bowl. After the ingredients have been well mixed, divide the batter into two bowls. Add two teaspoons of red food coloring to one bowl of batter and two teaspoons of blue coloring to the other, or as much is needed to get your desired color. Place the batters into two separate pans and place into the oven. Allow to bake for the time noted for your tin sizes, and remove to let cool. Once your cake has properly cooled, apply a generous helping of vanilla frosting. Be sure to ice the top of the red cake well, as you will place the blue cake on top. After you’ve stacked your cakes and frosted the sides and top, apply your red and blue sprinkles around the entire cake. If you wish, place strawberries and blueberries in a fun pattern on top, and you are done! This Fourth of July, don’t stress that you need to overspend. Follow our Basket Budget menu for a meal that’s sure to sparkle even more than the fireworks!